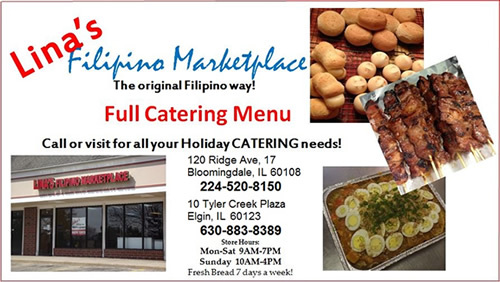 We offer a full line of Filipino and Asian groceries, produce, and frozen items in our clean, comfortable and brightly lit store. Come in and shop for all your grocery needs. We make fresh bakery products every day of the week. Some of our most popular items are our Pandesal, Spanish Bread, Pan de Coco, Pan de Ube, and Hopia Baboy. Come in and try our fresh breads hot out of our oven. We have a full catering menu to cater your event, large or small. Look to us for all your catering needs. We have great hot food available all day, from Adobo, to BBQ , to Caldereta, grilled fish, and much more. Carry-out or Dine-in and stay with us for a while.